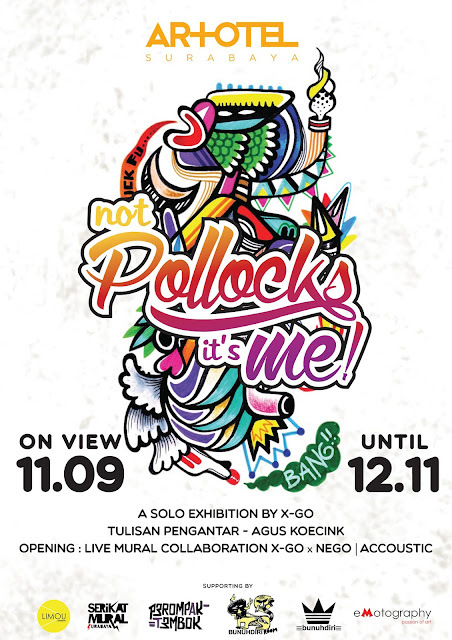 ARTOTEL Surabaya is please to hold Solo Exhibition of X-Go Warhol, an Indonesian local graffiti artist pioneer from Surabaya, on a view September 11 – November 12, 2015 at Art Space of Artotel Surabaya, lobby level. X-Go is one of well known street artist in Surabaya, together with his community often hold exhibition, discussion, and sometimes make difficult the civil service police due to their activity in bombing some walls on main roads of Surabaya and surroundings. X-Go always do mural some obsolete walls or painted walls with his expression about social issue or other propaganda in fighting againts injustice such as corruptions matter, politic, and others. He mural the walls with his own style and egaliter ways. Safrie Effendi, the Art Manager of Artotel Indonesia says, “Artotel Indonesia is proud to hold another exciting solo exhibition by well known Graffiti artist pioneer, Mr. X-Go Warhol. 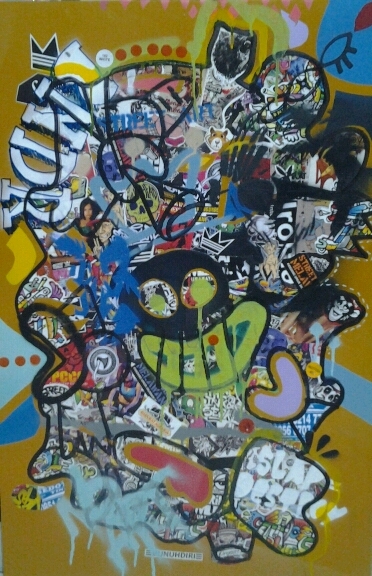 He has been dominating the Graffiti culture for over a decade, mostly in Surabaya and Sidoarjo. More, this exhibition is having a comparison between Paul Jackson Pollock and X-Go in terms of similarity and differentiation. Reason is to acknowledge in between 2 big different genre paintings style. Pollock was an influential American painter, particularly on abstract expressionist movement. He was known for a unique style with drip painting." Pollock and X-Go have the similar purpose in using their eccentric fun colors, but the different is Pollock play with lots of Organic forms and heavy strokes on his splatter. As well Pollock intended to be more expressive. While X-Go is quite neat and calm in making his work. X-Go executes his works in involving form, shape, and geometric. X-Go has a reference of Picasso and Mas Mundari to inspire his works. X-Go plays with full color, fun, cheerful and happy, however each artwork has a meaning to it, added Safrie. Artotel Surabaya, located in the heart of Surabaya at Jl. Dr. Soetomo, was opened in 7 July 2012 and marked the birth of Artotel. It is featuring 106 Studio, ROCA – 24 hours Restaurant, Hi Speed Wi-Fi, and ART Space at lobby. Within the purpose to maintain the Surabaya’s heritage surroundings, Artotel Surabaya is designed with colonial architecture element to maintain the neighborhood prestigious and combined with a twist of contemporary art through the grand stair as the centerpiece of the hotel. The hotel collaborates with 5 Indonesian emerging artists to showcase the originality of the local talents, and to bring the art of hospitality to the next level.